When you head the whisper of wings taking flight at night, it could be the sound of our local bats beginning their night shift in search of insects. Bats have made the news recently with the report of a teenage Oakland Zoo volunteer who was bitten by a wild, rabid bat, which was the third incident this year in the Bay Area. While rabies is no small matter, bats remain a vital part of our local and worldwide ecosystems. We have a dozen species of bats that make their home in the Bay Area. Some roost in colonies, while other species prefer to roost alone. Some live in man-made structures built just for them (such as bat houses), our own houses and buildings, or just live amongst the trees. I spoke with Jessica Sheppard, the East Bay Regional Parks (EBRPD) bat specialist. She's a Resource Analyst in the Stewardship Department and has done important work helping to document and track bats in the parks with support from staff and citizen science volunteers. Jessica trains park employees who act as bat liaisons that notify her about the different species' arrivals and departures in their seasonal migration. These bat boxes at Del Valle Regional Park house two different colonies of bats. Photo courtesy of EBRPD. Several weeks ago, the EBPRD’s Youth Employment Program participants had a special treat at one of Jessica’s bat surveys at Del Valle Regional Park. The eleven teens and young adults were trained and stationed near two bat boxes. Over the course of an evening, nearly 1,000 bats were counted as they exited the boxes. For these urban kids, this close encounter of the flying-mammal kind won’t soon be forgotten! Bat boxes are a very successful strategy for moving colonies residing inside district buildings. Bats are relocated from the buildings during the winter when they migrate away. When they return in spring, their new digs are available which is better for park facilities, visitors and the bats. 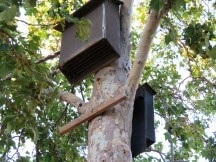 The bat watch begins by taking position under the two bat boxes and near the restrooms at Del Valle Regional Park. Photo courtesy of EBRPD. I asked Jessica about rabies trends in wild bats, and less than .5% of the overall bat population contracts rabies. Rabies incidents, reported by the Center for Disease Control, lists bats in third place (23.2% for all reported animals in 2010) compared to raccoons (36.5%), skunks (23.5%) and other mammals. 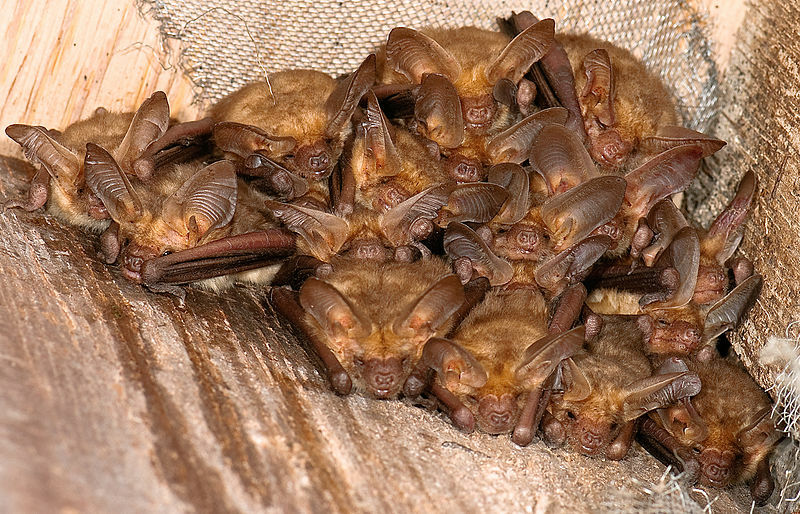 Perhaps the incidence of rabies in bats is relatively high due to two factors: only sick bats are encountered on the ground (as they're evicted from their colonies), so proportionally larger numbers of bats are reported with the disease; bat populations are increasing, which leads to more sick bats being encountered. For your own safety, if you see a bat on the ground in the East Bay, don't handle it and keep pets away from it. Contact a rescue organization or Alameda County Vector Control Vector Control. They also have a brochure you can read for more information about bats and other urban wildlife. And keep your outdoor pets' rabies vaccination current. If you’d like to try and see bats in the wild, go someplace with a large body of fresh water at dusk, such as Lake Anza, Shadow Cliffs or Lake Chabot from now through fall. The bats will leave their roost area and you might be fortunate to see them on their way out for their nightly insect feast. And enjoy this video from KQED QUEST about a spectacular bat colony north of us on the Yolo Overpass near Davis, CA.